The SSAL PR of Solar Water Heaters is a revolutionary product line from V-Guard - the brand that has always given the best in quality, technology, performance and service. 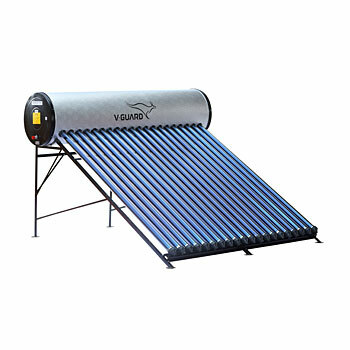 The most advanced in Solar Water Heaters, V-Guard Solar Water Heaters are made from high-quality components and come with international technology. The Evacuated Tube Collector System facilitates high-efficiency absorption and utilisation of solar energy, with minimum heat loss. V-Guard SSAL PR Solar Water Heater saves a substantial amount on electricity bills and other fuels, making it a worthy investment for a lifetime.These Solar Water Heaters can withstand a pressure of up to 4 kg/cm2, making them suitable for use in high rise buildings. They are also compatible with pressure booster pumps and that adds to their versatility. Their evacuated tubes are the absorber component in the solar water heater function. They absorb solar energy converting it into heat for use in water heating. Each evacuated tube consists of two glass tubes made from extremely strong borosilicate glass. So lower your electricity bills, reduce your carbon footprint and still be in a win-win situation as there'll be no compromise in the continuous flow of hot water for you in winters with the SSAL PR of Solar Water Heaters from V-Guard.